More than four million, health care visits in the United States every year can be accounted for by adverse drug effects. Taking the wrong medications together can shut down your organs, cause uncomfortable side effects, and in some cases, kill you. Many elderly patients don't get the information they need about the dangers of the pills they are taking every day, especially if they buy their medications from an online drugstore . Even if you go to a traditional pharmacy, your pharmacist may not have told you about some of the dangers in your medicine cabinet. And the more medications you take, the more potential you have for negative side effects. But don't worry, we've put together this list of types of medications the elderly should avoid if at all possible to protect your health, so read on. NSAIDs are common over-the-counter medications that can increase your risk of heart attack or stroke. They are great for reducing pain and inflammation in the short-term, but shouldn't be prescribed on a long-term basis to the elderly. This is because they can increase their risk of developing bleeding stomach ulcers, can increase their blood pressure, can shut down their kidneys, and potentially cause their heart to fail. Although it would be nice if you could avoid NSAIDs altogether, they serve an important medical purpose and don't have a better alternative. You should use caution before taking NSAIDs if you are at increased risk of developing stomach ulcers. This includes people over the age of 75, people who are taking oral steroids, people who take blood-thinning medications, and people who have kidney and heart problems. Anticholinergics are medications designed to block acetylcholine, which is a neurotransmitter in your body. This causes you to become sleepy. But when you age, that effect can become a problem. In fact, anticholinergic drugs have been linked to an increased risk of Alzheimer's disease and cognitive impairment. Muscle relaxants such as cyclobenzaprine, methocarbamol, carisoprodol, and others are prescribed to relieve pain in patients with muscle spasms. But in the elderly, they can have unintended consequences. They can make you feel confused and groggy, which increases your risk of falling and injuring yourself. They are also known to cause constipation, problems urinating, and dry mouth. Worst of all, there is little evidence to suggest that muscle relaxants are an effective medication. You're better off pursuing another course of treatment if one is available. 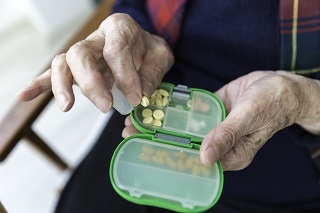 Tricyclic antidepressants are a common medication prescribed to people fighting depression, but the elderly should use caution when taking them. While mental health is a priority, try to find medications that have fewer side effects. Antipsychotics are a class of medication that is often prescribed by well-meaning doctors with patients who are behaving strangely and have dementia. But if an elderly person takes antipsychotics, they are at an increased risk of stroke and can die. As such, the elderly shouldn't take antipsychotics unless non-drug options have all failed and the patient has become a threat to themselves or others. Estrogen pills and patches are often prescribed to women as they are going through menopause to reduce their symptoms, but if you use them for too long, they become extremely risky. The problem is, increased estrogen levels leads to an increase in your risk of breast cancer, dementia, urinary incontinence, and blood clots. The longer you take estrogen, the more likely these side effects will be. The risk is also increased in women who smoke. Benzodiazepines are medications that are often prescribed to patients who are suffering from anxiety or insomnia. In elderly patients, the effect is increased, which can lead to cognitive impairment, delirium, and increased risk of falls and car accidents. As such, the elderly should try to avoid benzodiazepines as much as possible. But it may be necessary as a treatment for seizures, severe anxiety disorders, and end-of-life care. Androgens are prescribed to men to help with the symptoms of low testosterone. But unfortunately, they can cause heart problems. They can also lead to an increased risk of prostate cancer. Men who have been diagnosed with prostate cancer should avoid androgens altogether. But those who have severe declines in the natural testosterone production and severe symptoms may benefit from these medications. Proton pump inhibitors are prescribed to patients with gastroesophageal reflux (a fancy name for heartburn), as well as a medication to protect against bleeding stomach ulcers. But these medications have risks of their own. They can cause an increased chance of developing C. Difficile Colitis, which is a very serious intestinal infection. As if that wasn't enough, they can also increase the risk of bone loss and fractures in the elderly. For many people taking proton pump inhibitors, the medication is still being is prescribed but is no longer necessary. Consider seeing if your symptoms return when you stop the medication. Levodopa is a medication used to treat Parkinson's disease. But as patients age, they become more susceptible to adverse effects of the drug including orthostatic hypotension and confusion. To alleviate this concern, elderly patients who are new to Levodopa should be given a very low starting dose and monitored carefully for negative effects. Also, since many elderly people who have Parkinson's disease also suffer from cognitive impairment, anticholinergic drugs should also be avoided. Now that you have read about the types of medications that seniors should try to avoid, you can make a more informed decision the next time you open your medicine cabinet. For more helpful articles, check out our blog today.